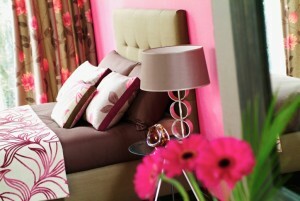 Bright pink can make a statement in an adult bedroom if you use it right. While it’s important to know the rules, it’s just as important to know how and when to break them. When it comes to interior design, it’s easy to become so bogged down by aesthetic rules that your home loses a unique sense of pizzazz. Learn how to break paint color rules and make your own with these tips and tricks. While dark colors can make a room look smaller, and black is often considered far too severe, when used properly this stark color can lend a modern and edgy look to any room. The trick is to balance it with a lighter hued paint color and clean lines. While it used to be believed that only neutral colors were suited for the bedroom as they help relax you, the psychology of color varies vastly from person to person. If your favorite colors are vibrant and bright, having a bedroom with a paint color that reflects that will relax and delight you. The key is to utilize a vast number of white details to balance out the boldness of your paint color. While if you want to expand the look of a space, it is wise to choose a lighter paint color, darker colors are ideal when you want to play up the coziness or intimate atmosphere of a smaller room. Saturated grays and jewel tones paired with slim furniture are ideal for making a small space feel cozy without being cramped. With the wide range of shades available, a pink paint color can be anything from a soft almost off-white to a vibrant fuchsia. This on-trend paint color can add a breath of life to any room and look playful and whimsical while still being elegant. Sophisticated details can really dress up a subtle pink, making it as grown up as a more austere gray or classic neutral.